If you ate out in restaurants in the ‘90s, this post is for you. It’s a little throwback inspired by one of my sisters who has been pregnant on and off (mostly on) for the last 5 years. I have leaned on her from time to time when planning menus for clients going through chemo. She gives me info about foods she could see herself eating during morning sickness, exhaustion and feeling generally crummy. This dish isn’t super high on her list for major nausea times, but fits the bill during comfort food craving times when green smoothies and salad are out of the question. Maybe because we grew up in the ‘90s when it was served in a weird sourdough bowl at parties, or microwaved and served with tortilla chips at every chain restaurant. 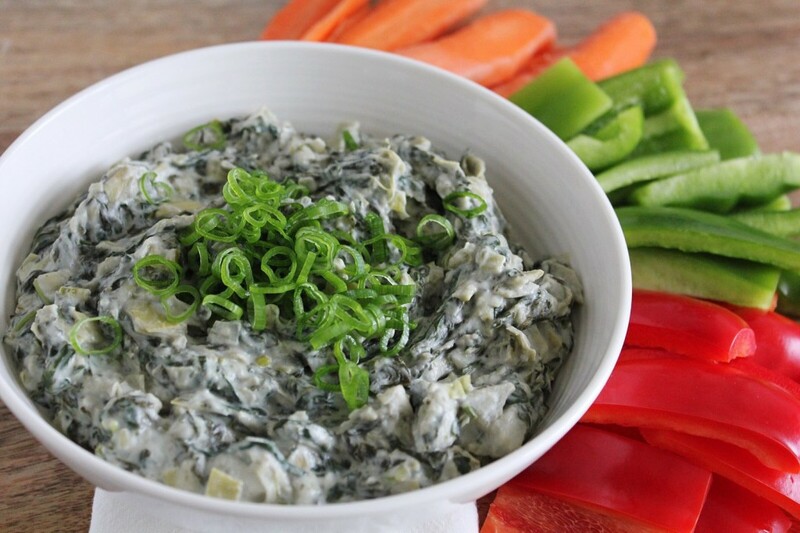 Does spinach and artichoke dip have a place in the world today? I’d like to think so –with a few tweaks, of course. First, put on some music. Current music that you are really loving these days. We want this dish to be re-invented in your mind as a modern, healthy but comforting dish. Attempting to live in the moment with our food despite its ’90s hair. If it conjures up TLC’s Waterfalls, I feel like we might have a partial fail on our hands, no matter how good this dip really is. Now for the ingredients. I can’t argue with the spinach and artichoke part -blood-cleaning greens and liver-supporting artichokes are nutritional superheroes for sure. Let’s cook the spinach ourselves though, (for several reasons, but most importantly, it TASTES a trillion times better than frozen) and it only takes a minute. I have used canned artichokes so that no one is dissuaded from making this recipe due to the daunting task of breaking down and cooking whole, fresh artichokes. Fresh is always better, but canned is ok once in a while, just rinse them well. I have also seen high quality frozen ones around, which is also an option. 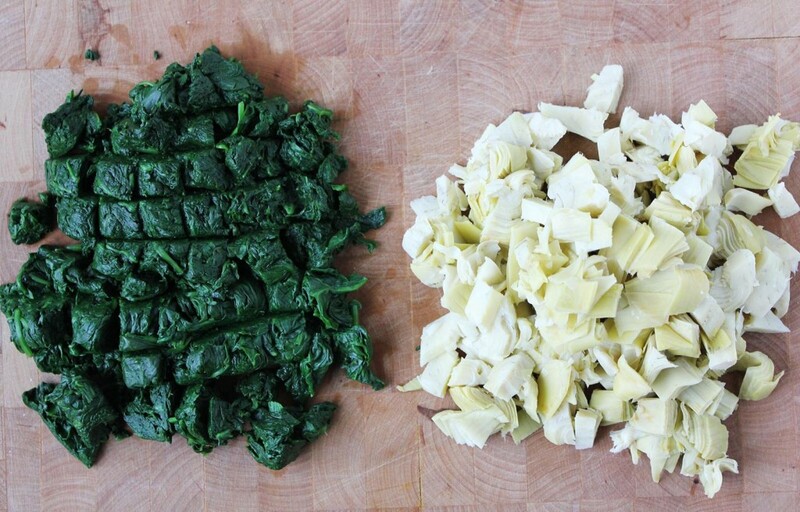 But if you do happen to make steamed artichokes just make a few extra, and use them in the dip the next day. 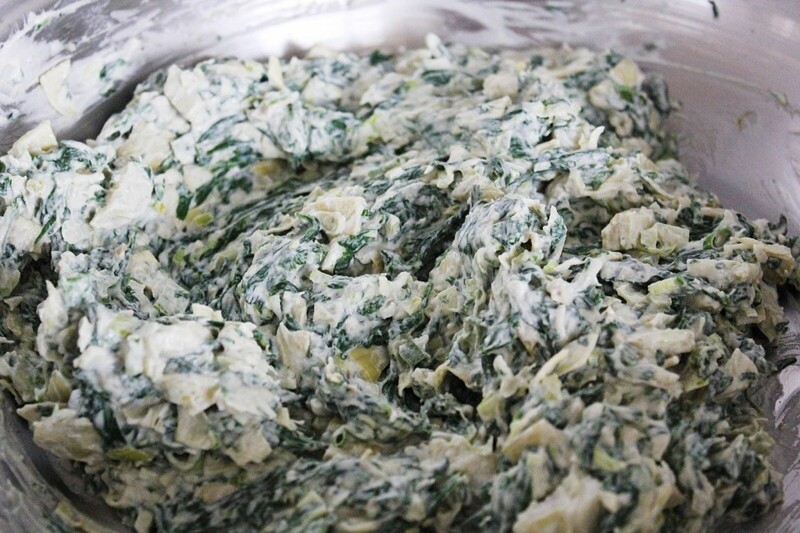 Once you get past the promising spinach and artichoke namesake ingredients, this dish usually becomes a festival of cream cheese, cheese and mayo. Obviously that won’t be happening here, but what we replace it with tastes pretty close to the same, if not better. Not a delusional statement, try it, you’ll be surprised. 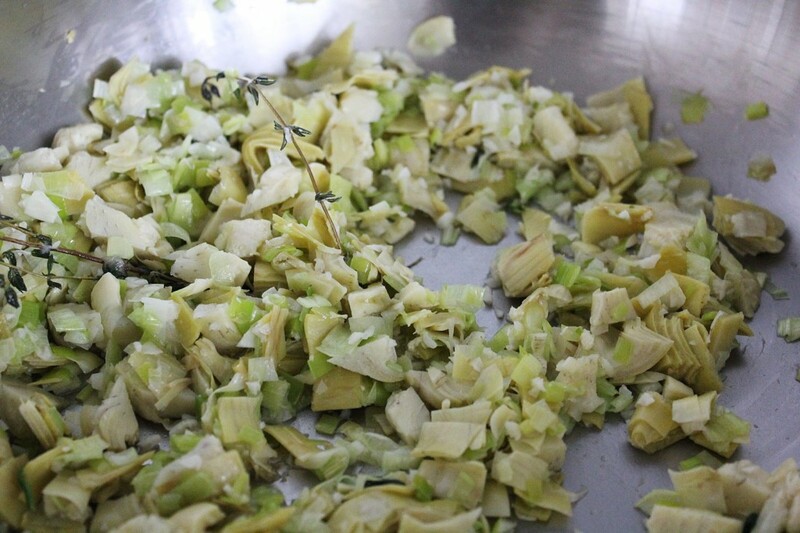 And then leek and garlic add the necessary depth of savory flavour while adding a cancer-fighting dropkick. Like most cheesy things, this dip tastes better warm than cold. If you are making it and serving it right away it will be warm, but if you are making it ahead (you can!) stir it in a frying pan on medium heat until it is hot. Add water if it tightens up, this will make it creamy again. Then spoon it into a warm bowl. (We avoid the microwave around here -it stores tea towels) You can also bake it in the oven/toaster oven but it takes a bit more time and…..doesn’t photograph as well…. It’s up to you. The last giant leap into the 2010s is to ditch the tortilla chips and serve it with fresh veggies. Not veggies and some other, naughtier bready option, just veggies. 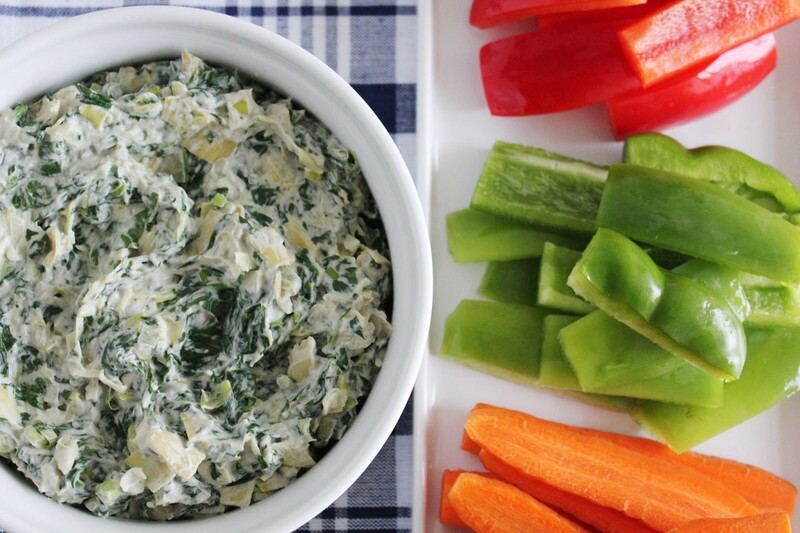 This way in order to eat as much of this dip as you’re going to want to eat, you’re going to have to down just as many broccoli florets and green peppers (my two favourite veggies with this dip). And if you spoil your dinner, it’s ok, it’s good for you, remember? 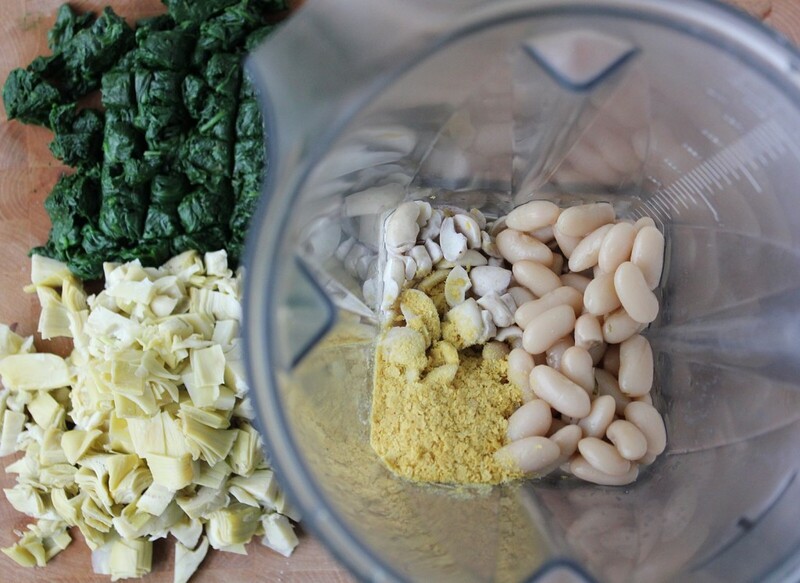 In a blender, purée the cashews, beans, nutritional yeast, 1c water and lemon juice in a blender until very smooth. Add more water if you need to. In a large pan, sauté the leeks, garlic and thyme in the coconut oil and a splash of water until the leeks have softened. Add the artichokes and continue to sauté for 5 minutes. 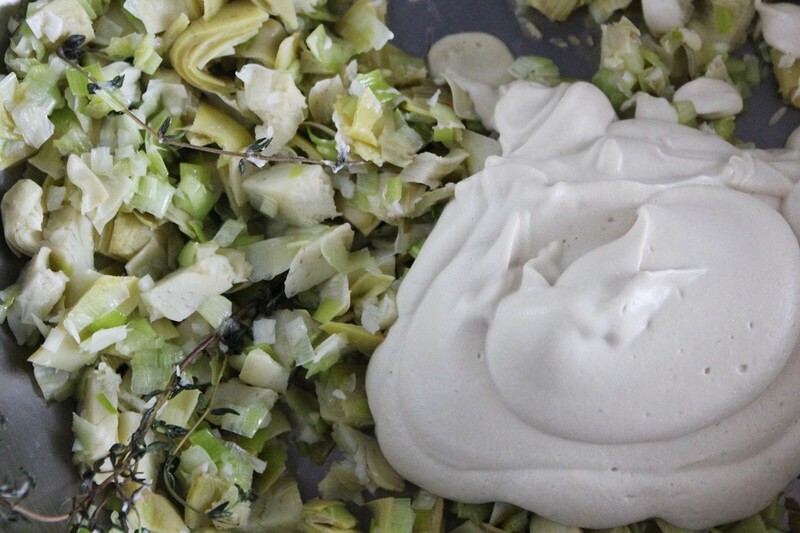 Add the cashew cream and spinach, mix well. Turn off the heat and stir in the green onions. Add more water to loosen it up and make it creamier if necessary.